Patella fractures are caused by directly by trauma or a compressive force, or indirectly as the result of quadriceps contractions or excessive stress to the extensor mechanism. Indirect injuries are commonly associated with tears of the retinaculum and vastus muscles. Patella fractures make up about 1% of all skeletal injuries. 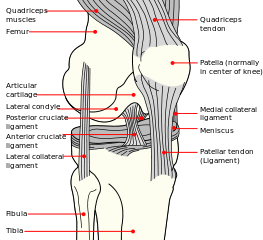 The patella is a triangular bone situated on the anterior surface of the knee at the distal end of the femur. It is the largest sesamoïd bone in the body and makes part of the knee joint. Vastus medialis and lateralis, as part of the quadriceps group, control movement at the patella. The extensor mechanism as a whole plays a major role in patella fractures. This consists of the quadriceps, quadriceps tendon, retinaculum, patella tendon, tibial tubercle and patellofemoral and patellotibial ligaments. 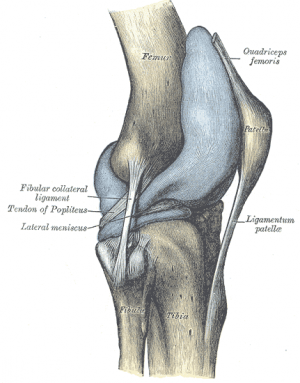 See the page on the patella for more details on the anatomy. In a recent study, the average mortality rate at one year after patella fractures was 2.8%, increasing to 6.2% in the geriatric population. Patella fractures are not associated with an increased mortality rate, as the relative risk of death was 0.9. Can cause damage to the articular cartilage of patella and femoral condyles. Tansverse/stellate: As a result of muscle contraction/extensive stress on the extensor mechanism, e.g. explosive quadriceps contraction after jumping from height. In acute cases, local anesthetics can be given to eliminate pain. This helps to aid in the assessment and diagnosis of the patella fracture. Indication: Significant displacement with extensor mechanism not intact. Manipulation under anesthesia or the arthroscopic releasing of adhesions is required when athrofibrosis occurs. As clinical healing phases do not always correlate with theoretical healing, the surgeon will guide rehabilitation taking X-ray findings into consideration. The following is a guide to be used in the rehabilitation of a patient after a patella fracture, but it is always good to discuss treatment plans with your orthopaedic surgeons. Conservative management are used when the extensor mechanism is still intact. Surgical intervention are done in cases where there are significant displacement and the extensor mechanism is not intact. Open reduction and internal fixation using the tension band wire technique is normally the treatment of choice. Only to be taken off for physiotherapy sessions, 0-30° knee flexion range of motion allowed at first. Return to normal activities as tolerated. ↑ 1.0 1.1 1.2 1.3 1.4 1.5 1.6 1.7 1.8 1.9 Frobell R, Cooper R, Morris H, Arendt, H. Acute knee injuries. In: Brukner P, Bahr R, Blair S, Cook J, Crossley K, McConnell J, McCrory P, Noakes T, Khan K. Clinical Sports Medicine: 4th edition. Sydney: McGraw-Hill. p.626-683. ↑ 2.0 2.1 Schuett DJ, Hake ME, Mauffrey C, Hammerberg EM, Stahel PF, Hak DJ. Current treatment strategies for patella fractures. Orthopedics. 2015;38(6):377-84. ↑ 3.0 3.1 Archdeacon, Michael T., and Roy W. Sanders. Chapter 54 - Patella Fractures and Extensor Mechanism Injuries. In: Browner BD, Jupiter JB, Krettek C, Anderson PA, editors. Skeletal Trauma, 4th edition. Elsevier Health Sciences, 2008. ↑ Crowther MA, Mandal A, Sarangi PP. Propagation of stress fracture of the patella. British journal of sports medicine 2005;39(2):e6. ↑ Sweetnam R. Patellectomy. Postgraduate medical journal 1964 Sep;40(467):531. ↑ Cedars-Sinai. Fractured Kneecap. Cedars Sinai organisation. https://www.cedars-sinai.org/health-library/diseases-and-conditions/f/fractured-kneecap.html (accessed 25/07/2018). ↑ Schunke M. Anatomische atlas Prometheus, algemene anatomie en bewegingsapparaat. Bohn Stafieu van Loghum: 2e druk. 2010. ↑ Everett L. Knee and Lower Leg. In: Marx J, Walls R, Hockberger R, editors. Rosen's Emergency Medicine: Concepts and Clinical Practice. 6th ed. Philadelphia: Mosby Elsevier, 2006. ↑ Orthopaedia. Collaborative Orthopaedic Knowledgebase, http://www.orthopaedia.com/display/Main/Patella+fractures (accessed November 10, 2010). ↑ 10.0 10.1 10.2 10.3 Duke Orthopaedics. Wheeless’ textbook of Orthopaedics. 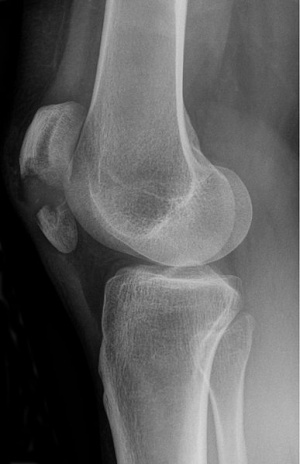 Fractures of the patella.http://www.wheelessonline.com/ortho/fractures_of_the_patella (accessed November 10 2010). ↑ Larsen P, Elsoe R. Patella fractures are not associated with an increased risk of mortality in elderly patients. Injury 2018. ↑ 12.0 12.1 Medscape. Patella Fracture Imaging. http://emedicine.medscape.com/article/394270-overview&gt (accessed 25/07/2018). ↑ Insall JN. Fractured kneecap: treatments. Institute for Orthopaedics and sports medicine 2007. ↑ 14.0 14.1 Whittle PA. Fractures of the Lower Extremity. In: Canale ST, Beaty JH, editors. Campbell's Operative Orthopaedics. 11th ed. Philadelphia: Mosby Elsevier, 2008. ↑ Melvin SJ, Mehta S. Patellar fractures in adults. Journal of the American Academy of Orthopaedic Surgeons 2011;19(4):198-207. ↑ 16.0 16.1 16.2 16.3 16.4 Walters J, editor. Orthopaedics - A guide for practitioners. 4th Edition. Cape Town: University of Cape Town, 2010. ↑ 17.0 17.1 17.2 17.3 17.4 Mehling I, Mehling A, Rommens PM. Comminuted patellar fractures. Current Orthopaedics 2006;20(6):397-404. ↑ 18.0 18.1 18.2 18.3 18.4 Günal I, Karatosun V. Patellectomy: an overview with reconstructive procedures. Clinical Orthopaedics and Related Research 2001;389:74-8. ↑ 19.0 19.1 McRae R, Esser M. Practical fracture treatment E-book. Churchill Livingstone/ Elsevier; 2002. ↑ 20.0 20.1 20.2 Fourati MK. Reeducation du genou après fracture de la rotule. Ann. Kinésitherapie 1986. ↑ Scolaro J, Bernstein J, Ahn J. In brief: patellar fractures. 2011;1213-1215. ↑ 22.0 22.1 American Academy of Orthopaedic Surgeons. Diseases and conditions - Patellar (Kneecap) Fractures. http://orthoinfo.aaos.org/topic.cfm?topic=A00523 (accessed November 10 2010). ↑ Shang ZG. Patellar fractures treatment and management. Unbound medline 2013;26(6):445-8. 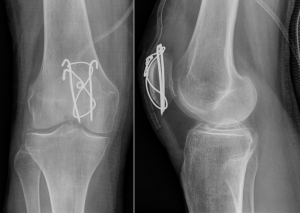 ↑ 24.0 24.1 24.2 Strauss J. ORIF Patella Fracture Post-Operative Rehabilitation Protocol, Hospital for Joint Diseases, 2008.